Spin the Plate was a surprisingly interesting read. Donna Anastasi weaves a tale of two people who do not fit well into society and brings them together in a believable way. Jo is a victim of sexual child abuse at the hand of her father, which she can not forgive. Not a small woman, she has become tough and reclusive. She earns a living as a tattoo artist and roams the streets at night rescuing and avenging hurt and abandoned animals. Francis is a small man, who was bullied as a child because of his size and shy nature. He is drawn to Jo so much that he seeks out a way to make her acquaintance and win her confidence. This unlikely duo build a relationship that works for them, and along the way surprising things happen. 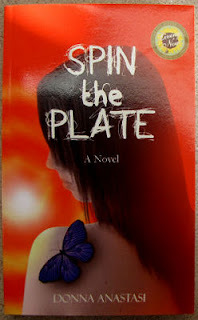 Spin the Plate is the 2011 Living Now Books Gold Medal winner. If you are familiar with this award, you will suspect before you begin reading that there is going to be a positive outcome. Living Now Books are “designed to improve and enhance our lives through creative ideas, [or] inspiring advice.” The core philosophy of the book is Christian. Yet the inevitable presentation of the Christian message is not forced or hackneyed. It simply grows out of Francis’ sharing of his life story. Yet, not all Christians will be comfortable with some of the actions of the characters. They are “real” people, not all good or all bad. Any author is going to bring in his or her own world view, and secular authors feel free to hint at or expound on their philosophies. Anastasi's world view is Christian, and it shows, but is not forced on the reader as coming from outside the story. I found this refreshing in a Christian book.